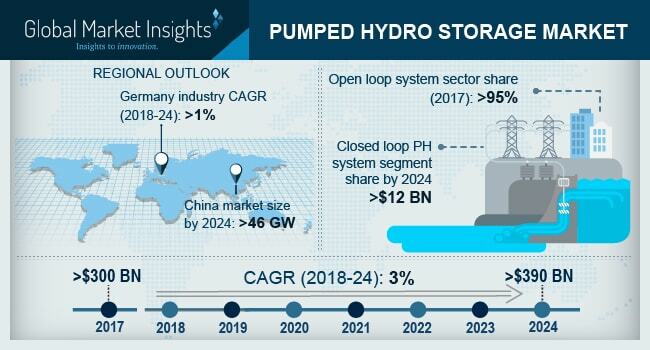 Pumped Hydro Storage Market size will surpass USD 390 Billion by 2024, as reported in the latest study by Global Market Insights, Inc. Adoption of sustainable energy technologies along with favorable government regulations toward expansion & upgradation of electrical network will foster the pumped hydro storage market. Increasing electricity outages across the emerging economies coupled with lack of effective monitoring systems will accelerate the product penetration. In 2017 NEA, announced an investment of USD 326 billion toward expansion of renewable energy infrastructure by 2020 across China. Spain PHS market will exceed 9 GW by 2024. Accelerating investments toward development of micro grid network along with propitious energy efficiency labelling & compliance plans will positively influence the product demand. The European Commission introduced directive (2012/27/EU) to provide a standardized regulation to promote energy efficiency in the EU countries. Grid stability, energy efficiency and higher storing capacity are some of the key features which will propel the pumped hydro storage market. The increasing electricity demand from off grid and remote areas across the emerging economies will encourage the product demand. As per EASE, these systems have an average efficiency range between 70 to 80% in comparison to other technologies. Refurbishment and upgradation of existing grid network along with increasing demand for grid support systems and other ancillary services will positively impact the U.S. pumped hydro storage market. Advancement in distribution generation technologies coupled with incorporation of green energy technologies will accelerate the product adoption. China through its Sovereign Wealth Fund has planned to invest USD 800 billion for the development of infrastructure across the nation. Open loop in 2017, accounted for over 95% of the global market. Ease of compatibility with a hydro power plant coupled with availability of natural flowing water stream will positively influence the product demand. As per DOE the U.S has around 3 open-loop projects which are in announced and under construction stage. Growing concerns toward energy security along with increasing adoption of sustainable energy technologies will stimulate the Japan PHS market. Upsurge in demand for sustainable energy storage coupled with rapid technological advancements will encourage the pumped hydro storage market. The industry has witnessed strong impact from leading energy storage players including Toshiba, Voith, GE Alstom and Hitachi on account of their extensive innovations and availability of large scale storage capacity. Eminent players across the pumped hydro storage industry includes EDF, Voith Hydro, Absaroka, Genex, Schluchseewerk AG, Toshiba, Dongfang Electric, Northland Power, SinoHydro, Snowdonia, Eskom, J-Power and Enel.